Ideal for restaurants, professional kitchens, cafeterias, coffee shops and home, these bags are a durable, certified solution for the collection and disposal of green waste such as food and organic matter. 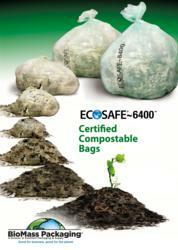 EcoSafe® bags and can liners from BioMass Packaging are made from compostable plastic. Many businesses want to send more of their food and organic waste to municipal composting facilities but don’t know where to source strong and economical can liners that are accepted in municipal compost programs. BioMass Packaging®, a division of Excellent Packaging, innovator and wholesale distributor of sustainable, biodegradable, and nature-based packaging for foodservice and other applications, has added high-strength, compostable can liners, to its line of compostable foodservice solutions. Restaurants, hotels, universities, and other businesses and institutions that need to dispose of food and organic waste can now use these clearly labeled, certified-compostable bags to confidently dispose of their food and organic waste in the green waste pickup, safely diverting it from landfills. Many municipal compost programs require that bags containing green waste must also biodegrade properly. 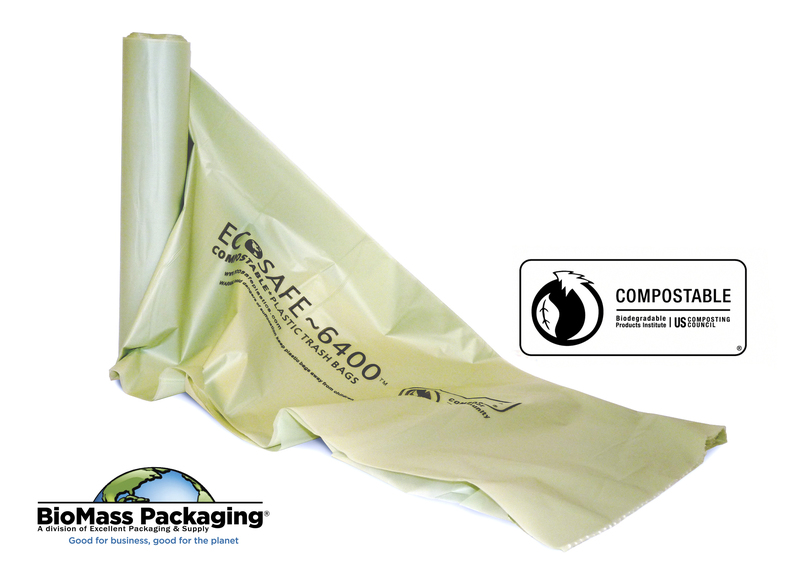 The new EcoSafe® bags and can liners from BioMass Packaging are made from compostable plastic that has received ASTM D-6400 certification (the industry standard for plastics that are designed to be composted in municipal and industrial aerobic composting facilities). The bags have been approved for use in municipal programs that have extremely stringent requirements, including approval by San Francisco’s Dept. of the Environment. BioMass Packaging’s can be liners used to line any waste receptacle up to 96 gallons, eliminating odors and the need to clean the receptacle every day. They offer high strength and superior puncture resistance, are guaranteed to hold up to 50 lbs, and perform well with hot foods, including boiling-hot liquids. Most importantly, they do not break down prematurely and retain their strength and integrity until they reach a compost facility. Convenience features include sufficient elasticity to ensure they fit snugly around the top of the bin without splitting or slipping into it, and a unique star-seal bottom that eliminates leaks and breaks. Manufactured in South Dakota at a Native American-owned factory, operated by the Sisseton-Wahpeton Oyate (SWO) of the Lake Traverse Reservation. The new EcoSafe can liners are available for immediate delivery directly from BioMass Packaging, or from the company’s BiomassPackagingStore.com online store. To learn more about the comprehensive range of bio-based, sustainable foodservice packaging products offered by Excellent Packaging, or to enquire about volume pricing, call (800) 317-2737 or email sales(at)excellentpackaging(dot)com. A PDF-format brochure is available online. BioMass Packaging (http://www.biomasspackaging.com) specializes in offering sustainable packaging solutions for foodservice operators that want to reduce their impact on the environment. The company is a division of Excellent Packaging (http://www.excellentpackaging.com), a wholesale distribution company that specializes in nature-based packaging for foodservice and other applications. Excellent Packaging brings decades of experience to research, source and deliver custom bio-based and traditional packaging and foodservice products that enable companies to integrate sustainable foodservice solutions into their business. Follow us on Facebook (BioMassPackaging) and Twitter (@BioMassPackage). BioMass Packaging compostable can liners are tough on trash, easy on the environment. Download the EcoSafe compostable can liners brochure.